Freshwater aquarium maintenance is not necessarily difficult – especially when you compare it to the work involved in planning and setting up your tank – but it is no less important. In the same way that you perform routine maintenance for your car (think oil changes, tire rotations, and car washes), you need to execute certain tasks on a regular basis to keep your freshwater tank clean. Before you learn the proper way to go about maintaining your aquarium, you may find it helpful to read about some of the Do’s and Don’ts of tank maintenance. Below you will find a list of five common aquarium maintenance misconceptions. This myth is by far the most common, and the most incorrect, freshwater aquarium myth. In theory, it seems to make sense that a smaller aquarium will require less maintenance than a larger tank based solely on the fact that a larger tank takes longer to set up. If you really think about it, however, you will find that this myth is completely false. In reality, the larger your aquarium is, the easier it will be to maintain. Why? It all comes down to water chemistry. Assuming you are already familiar with the basics about the nitrogen cycle, you already know that your fish produce waste that accumulates in the substrate of your tank along with uneaten fish food, decaying plant matter, and other debris. The beneficial bacteria in your tank work to break down that waste in a process that produces a toxin called ammonia as a byproduct – this is referred to as the nitrogen cycle. During the second phase of the nitrogen cycle, ammonia is converted into a less harmful substance called nitrite. In the third phase of the nitrogen cycle, nitrite is converted into nitrate. While nitrate is much less dangerous than ammonia, it is still toxic in high quantities. The more diluted the nitrate in your tank is, the less harmful it will be to your fish. Think about it this way – imagine two glass jars filled with water representing two different-sized aquariums. One jar is small and contains only four ounces of water (1/2 cup) while the other is large, holding an entire quart of water (4 cups). If you were to add one drop of red food coloring to each jar, with the food coloring representing nitrate, you will notice that the water in the small jar turns a darker red than the water in the large jar. Why? Because there is more water in the large jar to dilute the food coloring. Keeping this illustration in mind, you should now be able to see how an aquarium with a larger water volume will be better able to dilute harmful substances such as nitrate than a small tank. The fact of the matter is that larger tanks give you more room for error than smaller tanks and the increased water volume means that you do not have to perform water changes quite so often to keep the water quality in your tank high. 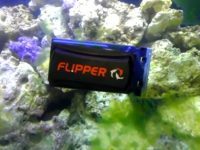 If you peruse the aquarium aisle at your local pet store, you will see a wide variety of products designed to correct various problems with your tank water. Some of the products you might encounter include pH adjusters, ammonia blockers, vitamin supplements, and other additives. While these products may seem like an easy solution to problems with water quality or water chemistry, they may come with some unexpected side effects. Adding any type of chemical to your aquarium will change your water chemistry, sometimes in unpredictable ways. For every chemical treatment you find on the shelves at the pet store there is a safer and more natural alternative. 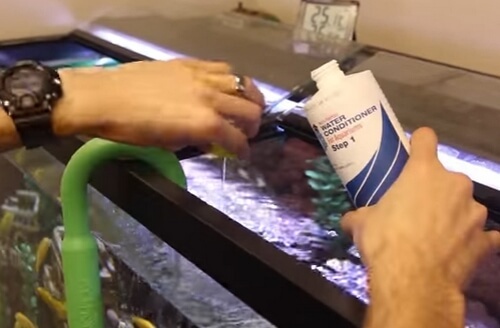 Instead of dosing your tank with an ammonia blocker, perform a water change to get rid of excess ammonia and make sure your tank isn’t overcrowded to the point that your fish produce waste more quickly than your beneficial bacteria can break it down. Instead of adding vitamin supplements to your tank water, feed your fish a varied diet of live, frozen, and flake foods. While it may seem easy to simply add a few drops of a chemical additive to your tank as a remedy for a problem, there is always a chance that the chemical will produce negative side effects for your water quality or for the fish themselves. When you first set up your aquarium, you may be nervous about making any changes that could affect the water quality and, subsequently, your fish. Do not let your timidity lead to poor decisions regarding tank maintenance – small water changes are ineffective, you should plan to replace at least 15% of your total tank volume in each water change. In order to understand the importance of water changes, think back to what you learned about the nitrogen cycle and the dilution of toxins in large versus small aquariums. Nitrate, the third byproduct of the nitrogen cycle, is less harmful than either ammonia or nitrite but it is still dangerous in large quantities. This chemical does not evaporate from the tank and your tank filter will not remove it – the only way to get rid of it is to physically remove it by performing a water change. Small water changes are ineffective in removing any significant amount of nitrate or other dissolved substances and the amount of water needed to refill the tank is inadequate to dilute any toxins that still exist in the tank. In order to gain the maximum benefit from your weekly water changes, you need to remove and replace at least 15 % of the total tank volume. If you have a 20-gallon tank, that equates to about 3 gallons – for a 50-gallon tank, it’s about 7 ½ gallons. Remember to use your gravel vacuum when siphoning out tank water in order to remove accumulated debris from your tank substrate and try to match the temperature and water chemistry of your tank water when refilling the tank. After debunking the last myth, you may be tempted to head toward the other extreme, from performing only minimal water changes to cleaning out the entire tank at once. Unless your aquarium becomes covered in a thick layer of wall-to-wall algae or you experience an unmanageable explosion of aquarium snails, you should never clean your whole tank at once. 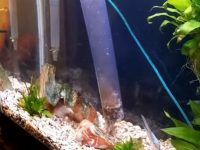 While it may seem practical, even sensible, to empty out your tank and scrub down your aquarium decorations if they become dirty, the consequences of such an action could be devastating for your aquarium fish. Think back to what you learned about the nitrogen cycle in debunking the first myth – small tanks are easier to maintain. 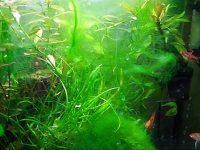 You should now have a basic understanding of what the nitrogen cycle is and, with this being the case, you should also know how important it is to cultivate and maintain a colony of beneficial bacteria in your tank. 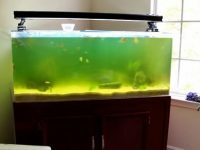 If you drain all the water from your aquarium at once and scrub down all of your tank surfaces and decorations, you could be decimating your tank’s entire population of beneficial bacteria in one fell swoop. When this happens, your tank will have to undergo the nitrogen cycle all over again to rebuild that population of beneficial bacteria and, in the meantime, the ammonia and nitrite levels in your tank could become dangerously high for your fish. Rather than cleaning out your entire tank at once, consider performing several large-scale water changes over the course of a week. 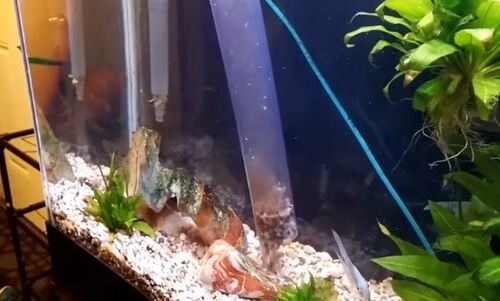 If it is completely necessary, you can remove some of the tank decorations to clean them, but only do one at a time so you do not kill off too much beneficial bacteria at once. Remember, your tank substrate is where beneficial bacteria are going to most highly concentrated, so when you do perform water changes and tank cleanings it is important that you do not let the substrate dry out – just use a gravel vacuum to remove accumulated debris. You probably already know that you should be changing your filter media on a monthly basis, but what about the filter itself? 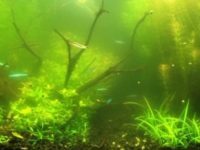 Many novice freshwater aquarium hobbyists assume that cleaning the filter is a routine maintenance task that should be completed at least every few weeks but it is not. Do not scrub out your filter! Even if your filter develops a coat of algae on the inside, as long as it is not negatively affecting the water quality in your tank, you should leave it alone. Why? Because, next to your tank substrate, your aquarium filter is the place where beneficial bacteria are most heavily concentrated. If your filter has a biological filtration component such as a Bio-Wheel, it is essential that you not only avoid cleaning the filter but that you never let the Bio-Wheel dry out. If you clean the filter or let the Bio-Wheel dry out, you could be killing a large percentage of the beneficial bacteria in your tank. As a result, your tank could end up re-cycling which could lead to some very dangerous conditions for your fish. Beneficial bacteria are an absolutely necessary part of a healthy freshwater aquarium so you should avoid doing anything that could have a negative impact on your tank’s population of beneficial bacteria. If you must clean your filter, simply give it a quick rinse to wash out accumulated debris but do not scrub it down or use any cleaning products on it. After debunking five of the most common myths and misconceptions regarding aquarium maintenance, you should have a pretty good idea of what it takes to maintain your tank. 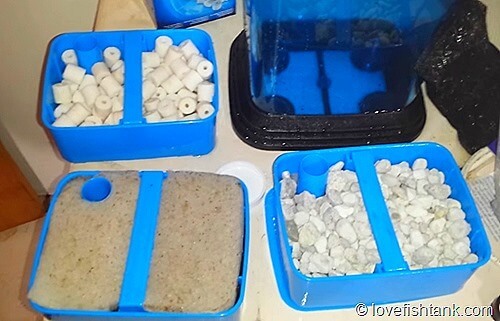 Tank maintenance starts from the moment you set up your aquarium and turn on your filter. From that point on you will need to perform weekly water changes of 15% to 20% of your total tank volume supplemented with a larger 25% water change once a month. Additionally, you should plan to change your filter media once a month to make sure that it is working properly to remove both solid and dissolved wastes from your tank water.